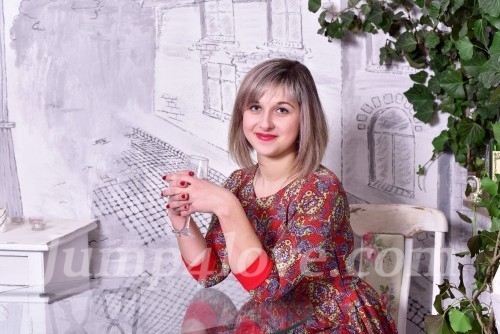 I am very funny, kind and cheerful young lady who is looking for her happiness. I like to communicate with people and can easily find common language with anyone. I am very tender and romantic woman whose heart is full of love and passion. I am not shy and like to express my emotions and feelings in public. I like to walk in the rain with my sweetheart with lots of sweet kisses and hugs while we hold our hands. I adore children and think that it is the best surprise that a man can give to his woman when they are in love. I am looking for sweet and tender man who likes to take care of his woman. I would like my sweetheart be strong and brave, so I could feel myself save in his lovely arms. I want we always support each other and be together whatever happened. I want our relations be based on trusting, understanding, loyalty and respect to each other wishes and desires. When I close my eyes I imagine handsome man with charming smell of perfumes near me. I know it is my prince who loves children and wants to be happy the same as me.